If you are looking for a family friendly hotel when visiting London, then it’s well worth taking a look at the Hilton London Metropole. It’s a great choice when visiting the city. This is our review of our two night city break at the Hilton London Metropole. On arrival at the hotel you are struck by the sheer scale of the hotel as you enter the stylish and modern lobby area. If you are looking for a small and intimate hotel then the Hilton London Metropole is probably not the place for you. The hotel is huge, with over 1,000 rooms yet the personal service we received during our stay would rival that of a small intimate hotel. 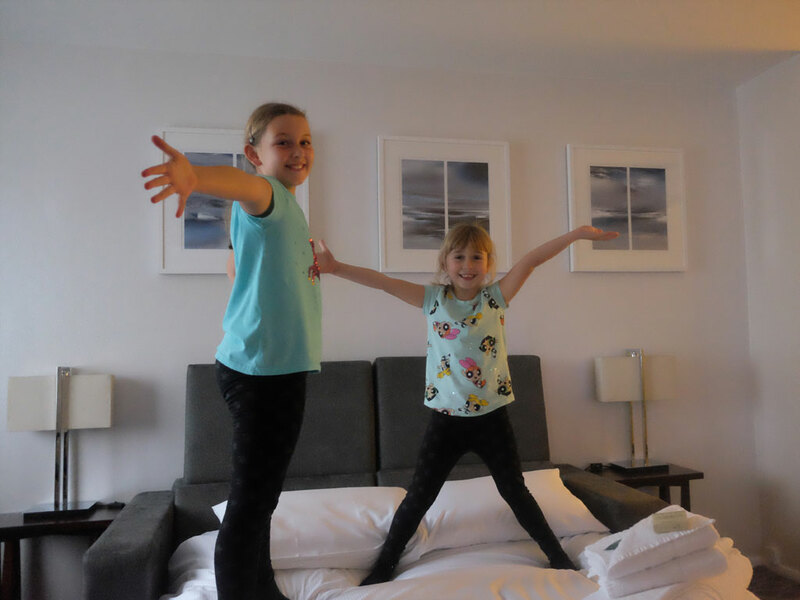 We have stayed at many Hilton hotels around the world but the check-in experience was one of the very best and most fun that we have experienced for the girls. 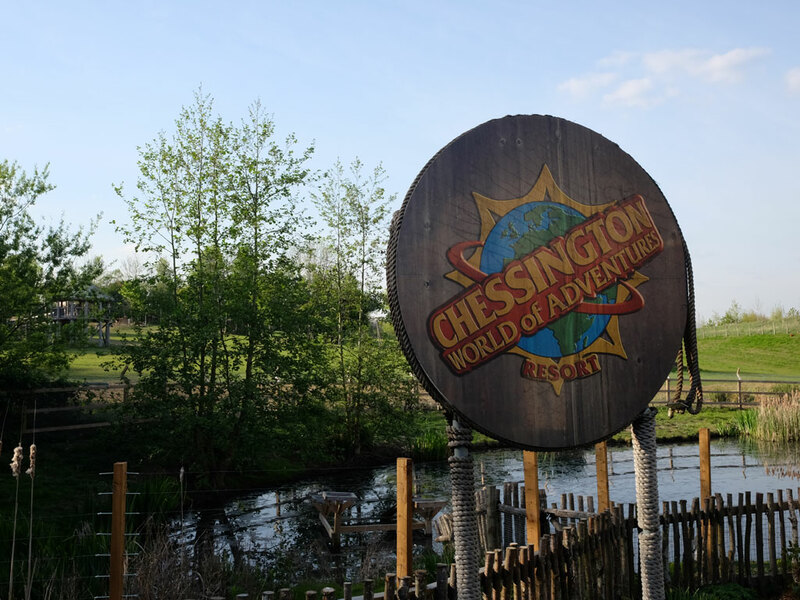 After a warm and welcoming check-in, the girls were given kids packs containing trails, child friendly London itineraries and best of all they had their photo taken with an instant Polaroid camera. This picture went into their own personalised passport and it was a lovely keepsake of their stay at the hotel. As Hilton Gold members we used the dedicated check-in for Diamond/Gold guests but there was a lovely separate check-in area for kids with its own child-friendly check-in steps. As our visit coincided with Halloween the girls loved all of the little Halloween inspired touches around the hotel, from pumpkins on the concierge desk to cobwebs draped over the check-in desks. Families are allocated rooms in the west wing of the hotel and our stylish queen superior family room was modern and spacious and a great choice for a family of four. With two comfortable queen beds our room had all the amenities you’d expect from a Hilton hotel such as a large flat screen tv, air conditioning, fridge and in-room safe. We’ve previously stayed in some hotels in London where all four of us can barely fit into the room not including our luggage and we don’t tend to travel light, so it was great to have so much space. From our 11th floor room, the floor to ceiling windows provided great views over London – we spotted the arch of Wembley stadium in the distance. The wooden ledge that spanned the length of the window was Holly’s favourite spot in the room. She would sit there and play with her toys taking in the views whilst her sister would be happily writing away on the spacious desk. Along with “Does this hotel have a swimming pool?” the next question we are typically asked when we settle into our room by the kids is “What is the wifi password?”. Thankfully the hotel ticked both boxes with a 12.5 metre pool and free wifi throughout the hotel. This offered all the entertainment options a child would need to keep them happy during their stay. The bathroom was modern and well-equipped with a plentiful supply of Crabtree and Evelyn toiletries. Were the beds as comfortable as they looked? Yep! We all had a great night’s sleep and we were refreshed each morning to discover more of London’s sights, shops and attractions. The hotel’s executive lounge was a lovely area to relax in and recharge our batteries with hot drinks and snacks. (you have access if you are staying in an Executive Room or have status with Hilton Honours.) As we arrived early morning, we used this lounge for some light refreshments until our room was ready. The ride in the glass elevator brought back memories of our stay at the Jumeriah Beach Hotel in Dubai – and it’s worth taking the lift to the top floor just to catch the great views over the city. One of our favourites was their afternoon tea served between 3pm – 5pm which offered a selection of teas, coffees, soft drinks and a selection of freshly made sandwiches, cookies, cakes, scones and jam. Having the executive lounge facility was a lovely addition to our stay, and the girls loved relaxing in here, as did my husband and I. In the evening between 6pm – 8pm a selection of canapes and drinks were available, both alcoholic and non-alcoholic but this was restricted to adults only. There were lots of other stylish communal spaces to relax in and a great range of places to enjoy the facilities of the hotel. The hotel had several bars, a coffee shop and Fiamma restaurant all located off the lobby area. After a busy day exploring the sights of London we didn’t want to venture out again and chose to make it easy dining at the hotel’s Fiamma Italian restaurant for our evening meal. What made our dining experience more unique was that from 5-7pm each day, children could join Fiamma’s chefs by making their own authentic Italian pizza. Both Chloe and Holly loved it – the look on their little faces as they created their masterpiece was brilliant. This was family-friendly dining at its very best. While their margherita pizzas were cooking in the pizza oven, the waiting staff brought out their starters of crispy chicken strips, warm carrot batons and a dipping sauce. For our starters, my husband and I had the bruschetta and for mains I chose the penne all’arrabbiata and my husband selected the rib eye steak and chunky chips, all of which were delicious. For desert, from the children’s menu, the girls selected the Chocolate lava cake with ice cream – which tasted as good as it looked. Prices are what you would expect at a 4-star central London hotel for evening meals, however children eat free when dining with an adult, which I thought was really good value. Hilton breakfasts are typically excellent and the buffet style breakfast offering at the Hilton London Metropole certainly didn’t disappoint with a range of options on offer from hot cooked breakfast options to small pastries, yogurts, fruit, cereals and some fantastic Hydration Juices. Served in the Fiamma’s Restaurant from 5:30am to 10:30am it did get very busy over the weekend of our stay with a small queue to get into the restaurant but breakfast was of a very high standard. As we had executive lounge access we could have had breakfast there to escape the crowds but we would have missed out on the many fun touches the hotel offers children at breakfast. They have their own breakfast kid’s corner featuring cereals, fruit and a highlight for the girls were the iced doughnuts. The colouring sheets and crayons were also a hit with Holly, keeping her entertained during breakfast. One the girls favourite areas of breakfast was the pancake machine, I think they had more fun making the pancakes than eating them! 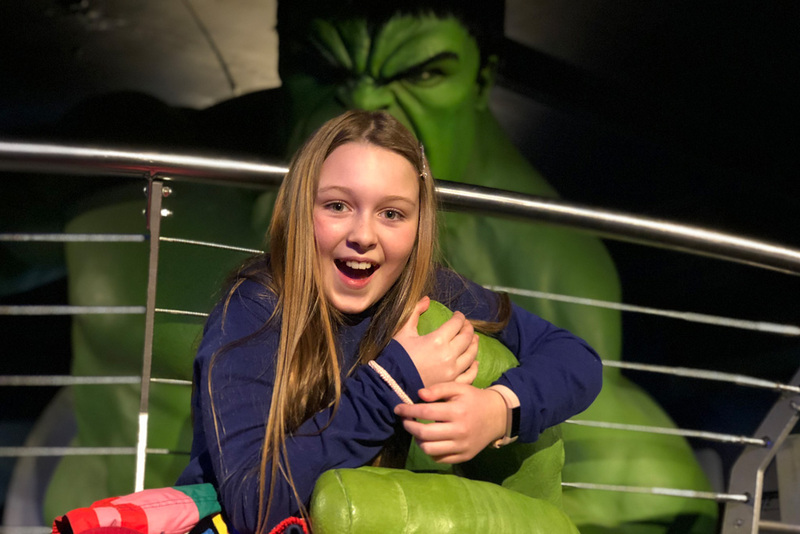 This was the perfect start to each day before setting out to explore some of London’s sights and attractions which included watching the amazing Wicked the Musical and walking across the glass walkways above the iconic Tower Bridge. We also climbed the Great Fire of London Monument and visited the excellent British Museum and Science Museum. The hotel was the perfect base for us to explore London. The nearest underground station, Edgware Road was a 2 minute walk away which easily connected us to all of the attractions we needed to visit when in London. Oxford Street and Hyde Park were just a 10 minute walk away. For guests arriving by train on the Great Western Railway into Paddington, the hotel is in a great location. On arrival at the station we asked a staff member for a taxi to the hotel, but he advised us that it would be easier to walk. He was right, the hotel was less than a 10 minute walk from Paddington. This area is being transformed as part of the Crossrail project, with shops , bars and restaurants – we called into Pizza Express here for lunch on our first day which was lovely. Checkout was as friendly and efficient as our check-in, and the hotel kept our luggage for the rest of the day so we could continue to enjoy our London city break until it was reluctantly time to return home. Overall and is it family friendly? Definitely, from the moment we arrived the whole family was taken care of. The level of service received during our stay was exceptional and this high level of customer service is a credit to the hotel management because it really does make a difference during your stay. Located in the heart of London with easy access to tube network, the Hilton London Metropole is a fun, family-friendly hotel perfect for a weekend break in the UK – we had such a wonderful stay.